Originally created to offer protection and comfort to the feet while the wearer goes about doing different activities, shoes evolved to serve more than just a functional purpose. They have become objects of style and fashion. In the past, shoes were made using leather, canvas, and wood but today, shoes are increasingly made using materials like plastic and rubber. 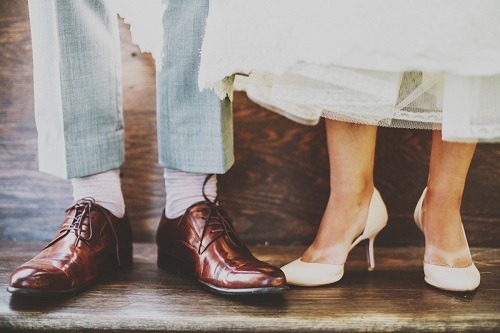 While there are plenty of unisex styles of footwear that both men and women can don, there are key differences between men’s and women’s shoes. Men’s shoes are wider than women’s shoes to take into account the fact that their feet are generally wider than women’s feet. Women’s shoes are often thin and narrow. They also have the appearance of being more delicate than men’s shoes. Compared to women’s shoes, men’s shoes have limited styles and designs. Men’s shoes are bigger than women’s shoes. Generally, the size difference is often 1.5 inch and 2 widths broader than women’s shoes. This means that a size 9 in men’s shoes will be a size 10.5 in women’s shoes. Men’s shoes have a standard size of D while women’s shoes have a standard size of B.
Oxford, Monk-straps, derby, and slip-ons are the common types of men’s shoes. Oxfords are shoes that have a “closed lacing” or a vamp with a V-shaped slit where the laces are fastened to. Monk-straps are shoes that fasten with a buckle and strap. Derby shoes have “open lacing,” which means the laces are independently fastened to the vamp. Slip-ons, such as loafers, contain no fastenings or lacings. Women’s shoes come in a wide variety of styles, but the most common types are high heels, ballet flats, sling backs, mules, and pumps. As the name suggests, high heels are shoes that lift the heels. Shoes that are at least 2 inches above the toes are considered high-heeled footwear. This type of shoes are often worn during social outings or more formal occasions. Ballet flats are footwear with very low heel so the wearer’s feet are almost completely parallel to the ground. This type of shoes also typically have a relatively short vamp so ballet flats are ideal for warm weather or when the wearer needs to be on their feet for long periods of time. Sling backs are shoes that are attached to the feet through straps behind the heel instead of fastenings that go over the foot. Mules are footwear that are backless or have no fitting around the heel. Pumps, also known as “court shoes,” are slip-on shoes that are high-heeled. Men’s shoes are often decorated with a cap, an extra leather or material that caps the toe, or brogues or wing-tips, a perforated panel that extends toward either side of the shoe. There are a wide variety of options when it comes to decorative additions to women’s shoes including fabrics, gems, metals, feather, and so on. One of the biggest differences between men’s and women’s shoes is in the size and width of the footwear. Men’s shoes are typically wider and longer than women’s shoes. Another notable difference between men’s and women’s shoes is that men’s shoes come in a much more limited style and design in comparison to women’s shoes. Wendi Garcia. "Difference between Men’s and Women’s Shoes." DifferenceBetween.net. November 9, 2017 < http://www.differencebetween.net/object/difference-between-mens-and-womens-shoes/ >. Can a man wear woman’s variation of a work boots to down size? New Balance Author. “How to convert your women’s shoe size to a man’s shoe size.” New Balance Athletics. Web. 1 Nov. 2017.